After all of the excitement at Porlamar we were more than happy to get to a quieter locale; one without gun shoot outs for starters. Both of our nerves were a little raw, mine more that Doug’s, I am sure. We staged at Coche to get ready for an early morning departure (4.30 am!) to Medregal Village which is at the easterly end of the Golfo de Cariaco and 50 NM from Coche. Medregal Village is a small resort/boatyard located in a very remote area. There is only one road to the resort and it is a dirt road with numerous ruts and floods and it is a full day bus ride to anywhere of consequence. 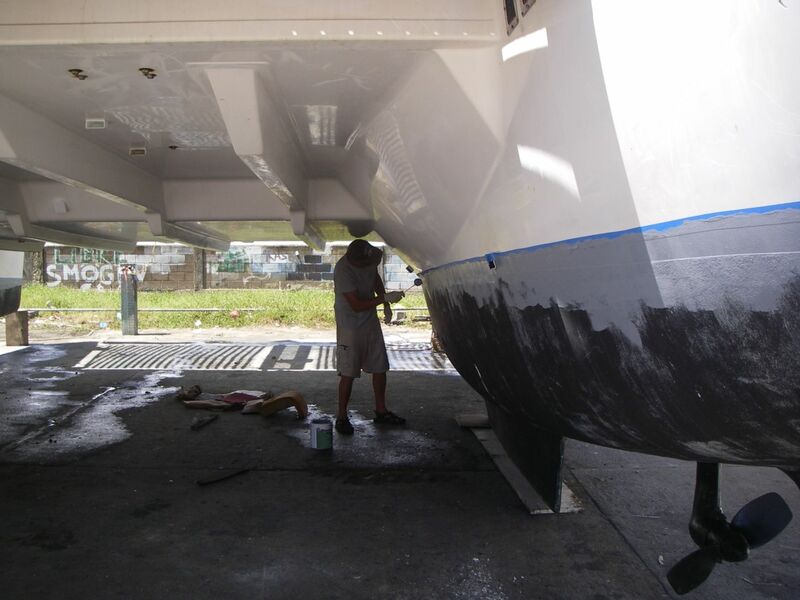 A few cruisers we knew were planning on hauling out there to perform the annual ritual of cleaning the bottom of their boats and applying numerous coats of antifouling in the hopeless assumption that this antifouling will keep the barnacles off. 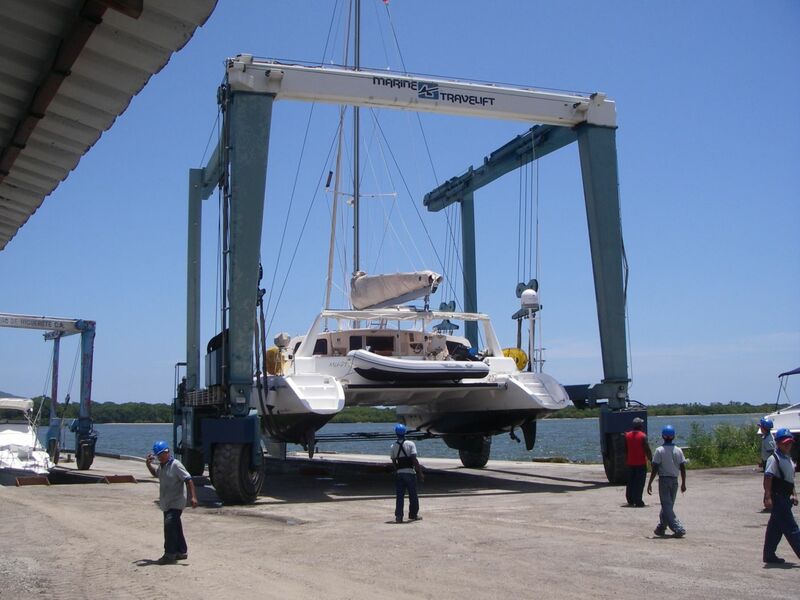 We had originally planned on hauling MS there but we found out in Porlamar that the new catamaran lift that was to be ready for our arrival was still months away from being ready (manana, manana, we’re in Venezuela, whaddya expect!). So we had to find somewhere else to haul but until that time we thought Medregal would be a good place to hang out for awhile with some fellow cruisers we knew and do the potluck/drink thing a few times. We had heard that it is an easy going, small resort where boats could rents rooms with air conditioning while working on their boats and escape the whole living aboard while “on the hard”. Believe me, we can speak from experience, that is no fun. Medregal also had laundry facilities, clean showers, an “on your honour” bar system (kewl) AND it was complete with an in-ground pool (yay! ), which would be perfect to tackle that incredible afternoon heat. Sounded like heaven to us. Our trip there was pretty uneventful. There was not a breath of wind and so it was a motor the entire way. 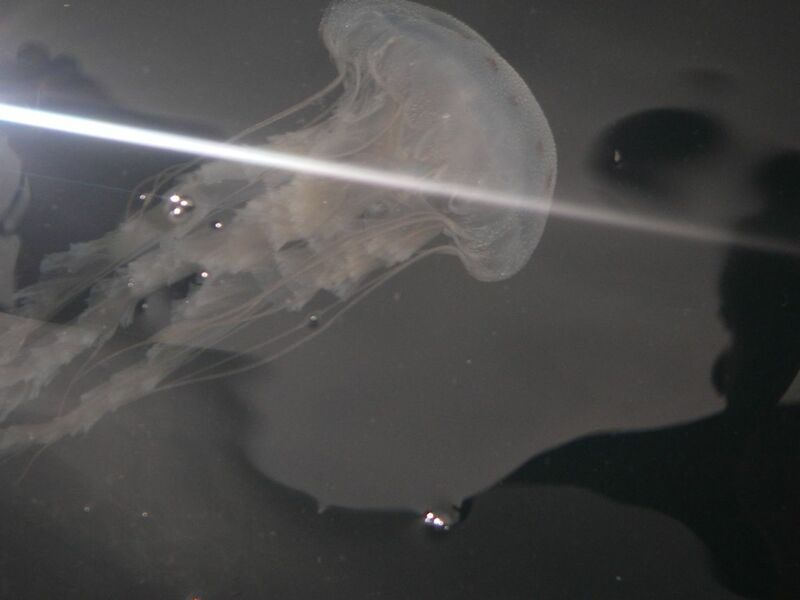 Because there wasn’t any wind the water was like glass and we could see hundreds of jellyfish near the surface. 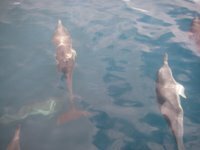 Once we rounded the point headed east into the Golfo we were joined by hundreds of dolphins (not kidding). 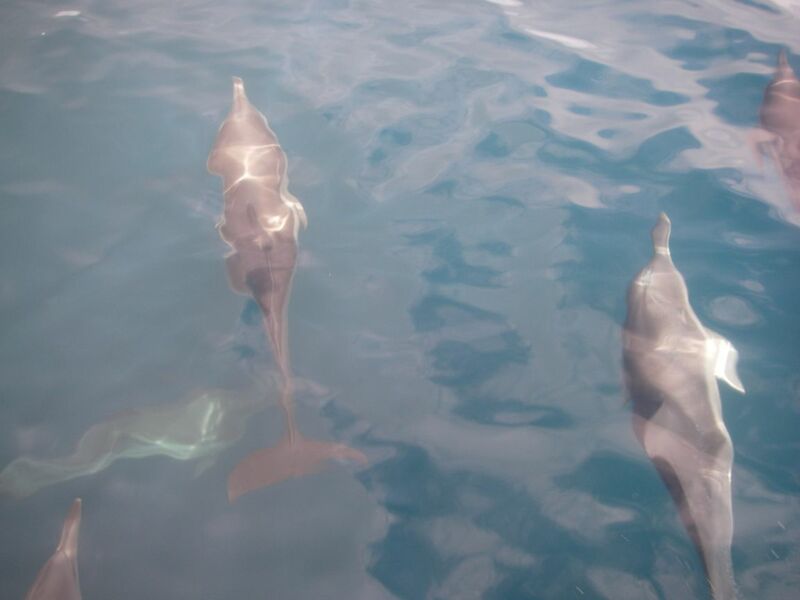 There were so many dolphins we were surrounded by them for a mile or so and they jumped and frolicked at the bow of the cat for a long time. We took many pics and we were lucky enough to actually see them in the pics and not just the surface of the water as is usually the case. We arrived at Medregal in the mid afternoon and noticed that there were dead fish that looked like large sardines floating all over the anchorage. I made up my mind pretty quick that I would not be swimming in that mess. Thankfully there was a pool. We did our grand tour of the resort and saw the laundry facilities which consisted of one sorry looking washing machine that worked only occasionally. Then we eagerly went to check out the pool. What a letdown. The pool hadn’t been cleaned for months and it was full of green sludge. Not swimming there either. Hopefully the showers were half decent….thank God, they were okay. The “on your honour” bar was okay too but it only stocked small bottles of cervesa or very cheap rum. Oh well. We would make the best of it. The lift was not working, and Meggie, who had hauled out a month ago, had been waiting for over two weeks to be put back in the water when we arrived. Mike and Kylie were a bit frustrated, to say the least and the level of frustration continued to grow for them and other boats waiting to get hauled. It was another four weeks before the lift was repaired for a total of 8 weeks inoperable. Cruisers learn real quick to be patient in Venezuela. After a few days we also quickly learned that Medregal and the eastern end of the Golfo have their own unique weather system. 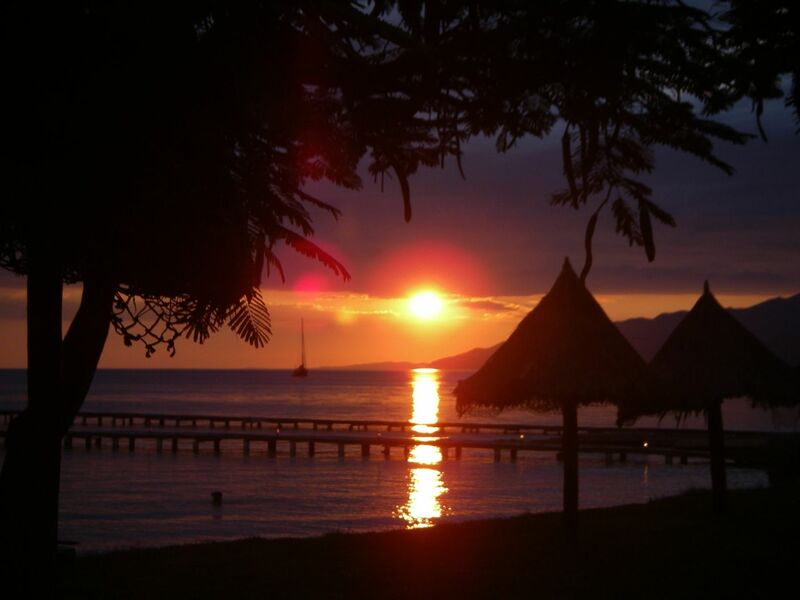 Every day, without fail, the heat would build and build until it became unbearable and then huge thunderheads would accumulate until, finally, around 3 p.m., reverse winds out of the west (not the prevailing easterly wind) would put all of the boats on a lee shore. The wind speed was anywhere between 20-40 knots accompanied by large breaking waves traveling the length of the Golfo, some 20 miles. These squalls tended to last ½ hour to an hour and, although short, were vicious. Not fun but after awhile you saw the clouds starting to form and you got prepared. There were lots of flies and other bugs here as well. 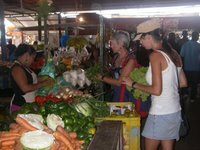 This place was not what we thought it was going to be but there wasn’t any crime and considered very safe so that was a big plus to us after what we had experienced in Margarita, for a time. Every Saturday (supposedly) there was a “bus” that took any of the cruisers that wanted to go to the Cariaco market where we could buy provisions. We all stuffed ourselves into the back of some rickety truck that had been outfitted with hard benches in the bed and hung on tight for the bumpy, dusty hour long ride thru floods from the previous afternoons deluge and huge ruts left by large trucks trying to transit the dirt roads bringing necessary product to the remote villages. The market is very colourful with fresh produce, fresh fish complete with heads attached (we had no idea what kind of fish some of them were) and all sorts of hanging slabs of meat dripping blood on the concrete floor. Not exactly your gourmet neighborhood grocery store. 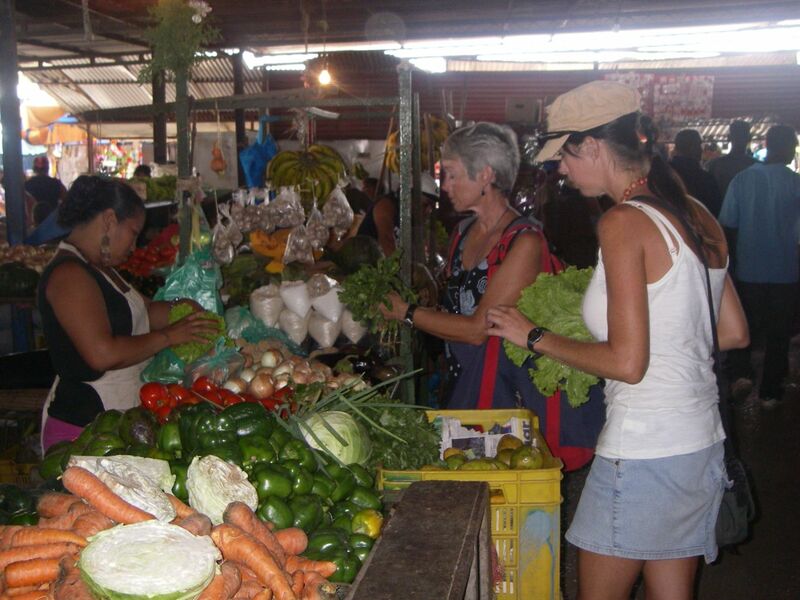 The market is also noisy and confusing with the Venezuelan farmers yelling back and forth and loud traditional Venezuelan music blasting out of huge speakers. One elderly woman wearing an apron spattered in blood, holding a large meat cleaver and missing all of her teeth, sang a little Venezuelan ditty while standing beside a pen of live chickens (who seemed quite frantic), and holding a large meat cleaver. Kewl. Of course, there isn’t any refrigeration at the market, so flies are having a field day all over the meat and fish and you have no idea how long it has been unrefrigerated for. Yum. 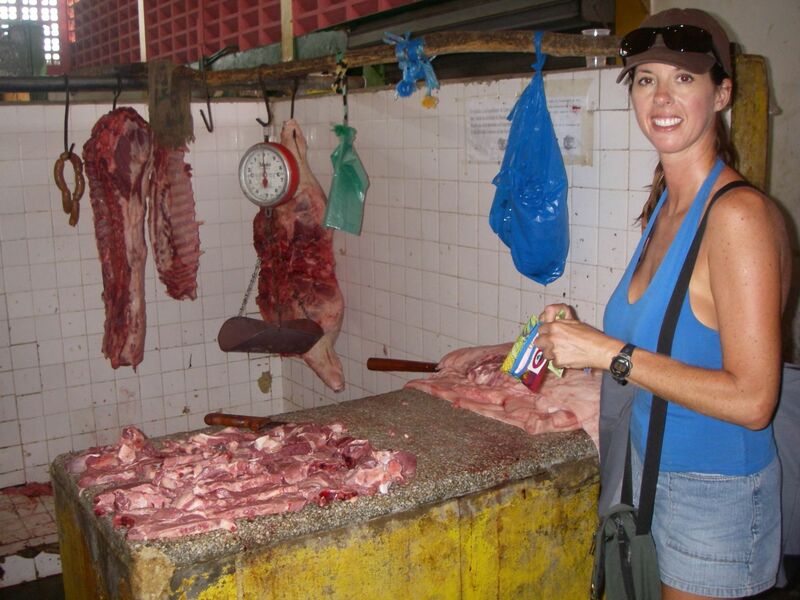 With that in mind we bought a large amount of pork ribs for next to nothing (see pic, I look really confident in my purchases. LOL!). We did manage to find one store that had refrigeration and bought ground beef there. It’s difficult when you’re in a strange place and you don’t speak much of the language but it certainly was interesting. I got to practice my broken Spanish and between that and my ridiculous hand signals they seemed to understand what I was saying. Hey, how ‘bout that? We hung out at Medregal for four weeks (your probably wondering why) as we were waiting for mail from Canada to reach us before we left. It took the full 4 weeks to arrive and once the mail showed up we hightailed it outta there. (To be fair the pool was cleaned the second week we were there and we did en joy it most afternoons.) 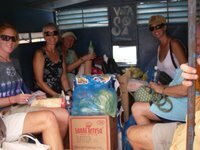 We headed for Cumana for a short provisioning and diesel stop and then to Tortuga, one of the legendary out islands we had read and heard so much about. We were in Cumana for two short days working as fast possible to get out of there as it is unsafe, and there were large rats and flying cockroaches at the marina where we MS was docked. Yuk. We made sure to keep MS locked up tight, which made it hot, but better that than the invasion of these nasty critters. We couldn’t wait to get out of the stifling heat of the Golfo and get out where the wind blows thru the cat and you can jump into clear turquoise water whenever you like. We had arranged to have MS hauled on the following Tuesday, in Carenero, which was further west down the coast of Vennie. That gave us 5 days to enjoy and hang at Isla Tortuga before the dirty, hot work would begin. 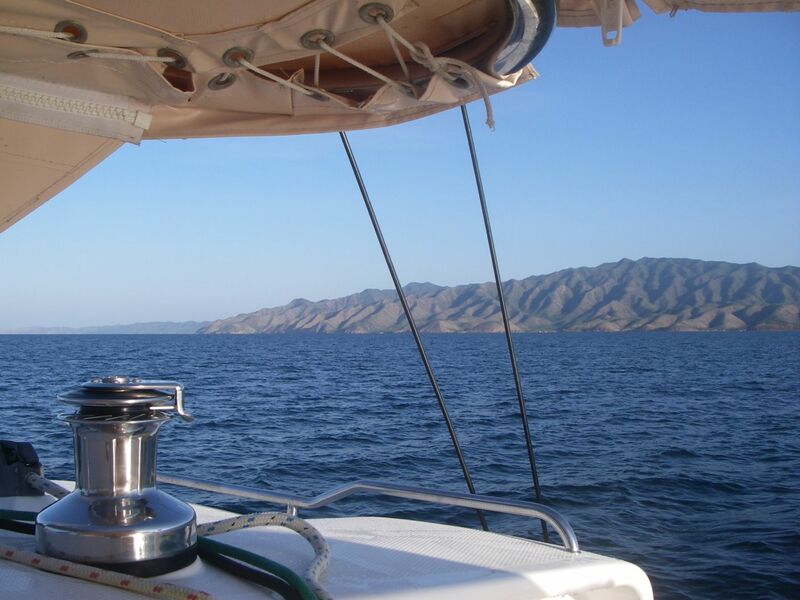 Again, we motored the entire 60 nautical miles to Tortuga, which laid to the north west of Cumana, as there was not a breath of wind. We arrived in the dark. This is a no no, but we were delayed getting diesel in Cumana that morning and couldn’t leave as early as we would have liked. Thankfully, Tortuga is a very straightforward approach. We couldn’t see anything of our surroundings when we arrived so we hit the hay and the next morning we were exhilarated to find ourselves in spectacular surroundings. An incredibly long white sand beach, azure waters, turtles poking their heads up to say hello and a very much-appreciated breeze. The first thing we did was jump in the water starkers. Woohoo! After the dark, murky waters of the Golfo and the stifling heat with no wind (except for the violent storms!) this was like heaven on earth. For the next handful of days, we relished the beautiful scenery, snorkeled, kayaked, and generally just lolled about on noodles in the water or snoozed in the hammock. While we were snorkeling, we would poke our heads into all of nooks and crannies looking for lobster. Lobster are out of season in the summer months and so off limits but it still fun to spot their antenna sticking out of a hidey hole. We did notice the French boats were also snorkeling for lobster but they were taking them and enjoying lobster for lunch and dinner. That seems to be the French way from what we have seen in our travels as cruisers. The rules are in place for a reason to give the lobsters a chance to grow and become plentiful. Sadly, it was time to leave this lovely place and sail southwest to Carenero to have MS hauled and commence the dirty hot job of antifouling the bottom. 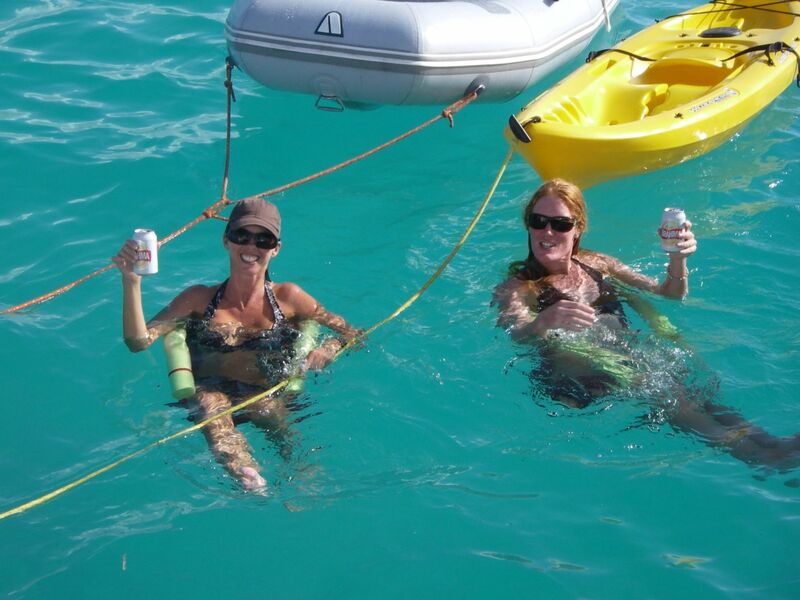 I won’t go into much detail about it except to say that we both worked very hard for 3 days to get back into the water as quickly as possible and we crashed every nite. 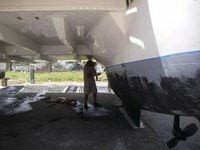 The boatyard, Astillero de Higuerote was more than satisfactory, clean and professional and we were very happy with some gel coat work we had done (the price was excellent) and with the staff overall. If you ever find yourself in Vennie needing to haul your boat this place is worth checking out. As soon as we were finished we made tracks for Los Roques! 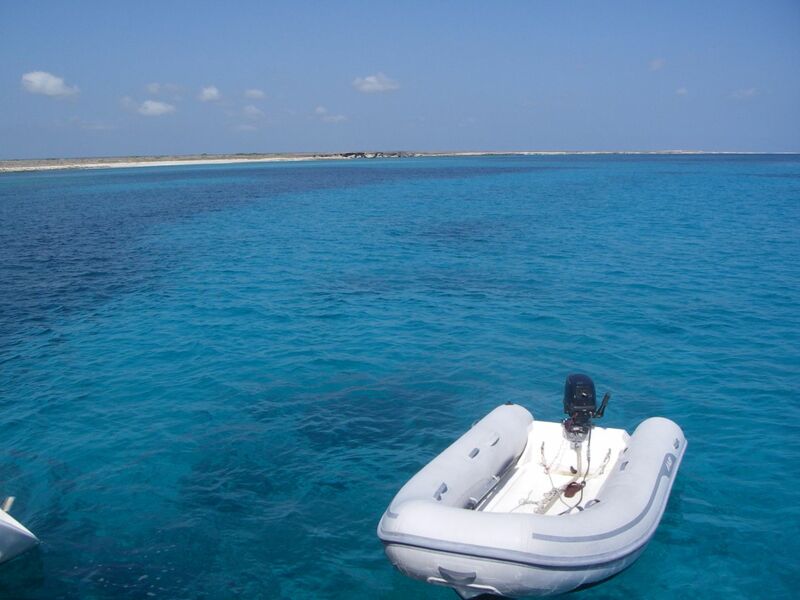 I will leave off here but stay tuned for log #i 16, Los Roques, out very shortly. We CAN'T WAIT TO COME ABOARD!!! Man, we are counting down the days till we can experience the best ever vacation, AGAIN!!! !